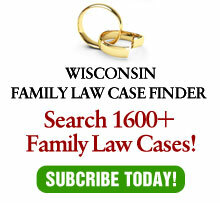 Frequently, I have criticized Wisconsin’s attorney discipline system for two reasons. First, it’s the SC is far too lax (I don’t post every time the SC issues a lenient decision so that I don’t bore readers) and second, the length of time it can take to complete the process. A case last week, OLR vs. John Kenyatta Riley sets a new record in the second category. ¶99 This is a landmark case in attorney discipline, as Justice Prosser has pronounced. But its landmark status, from my perspective, is the length of time the instant case has lingered in this court. I think it wins the prize for taking longer to decide than any other OLR proceeding I can remember or find. It is a prime example of significant, unnecessary delays in completing a disciplinary matter. Delay appears to exist at every level of the disciplinary proceedings, but the final delay at this court in releasing the lead opinion is outrageous. and issued her report on April 18, 2012.
the instant case… this opinion is being released almost four years after oral argument, almost six years after the complaint was filed, and almost 10 years after the conduct at issue. In addition to the attorney being able to continue to practice and possibly harm other clients, there are victims to consider. As one of the attorneys retained by OLR on occasion to prosecute these matters, it is very difficult to explain to a victim how a case can simply sit on the desk of the justices for such a long period of time. Some delay is due to the pre-charging process. Disciplinary committees can take quite some time doing their investigation and issuing recommendations. Some referees (certainly not all) take their sweet time setting scheduling conferences and trial dates. But, by far, the greatest delay is at the SC level. It is not infrequent for the court to take months – not weeks, but months – to simply appoint a referee. If there is a petition for an interim appeal, you can add more months to the process just for the court to decide whether to accept the appeal. And then, just like in the Riley case, once the case has been submitted in final form, it can sit before the court for months and months. A few years ago, I represented OLR in a case involving an attorney charged with (and eventually found to have violated) a number of counts of failing to exercise due diligence in representing a client. The case sat before the SC in final form forever (no, it was not that complicated). I asked OLR to permission to file seven complaints – one against each justice – for failing to exercise due diligence as the court’s lack of diligence was worse than that of the lawyer. OLR, unfortunately, rejected my request. It isn’t the workload – the court has clerks and commissioners to assist it. And if they still can’t get their work done, maybe they shouldn’t take three months off every year. Trial courts and the court of appeals work 12 months a year, and they both have less support than does the SC. There is a saying that “justice delayed is justice denied” and that maxim certainly applies to Wisconsin’s so-called disciplinary system.